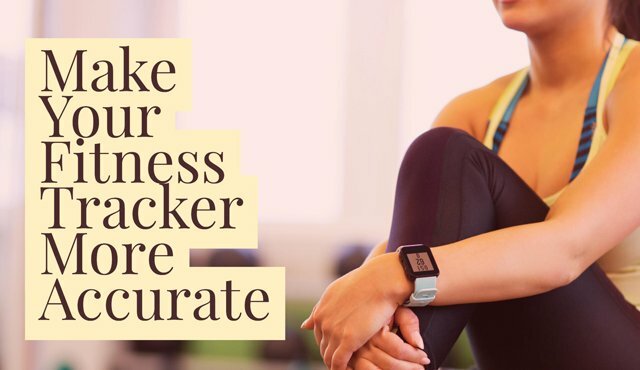 A few minutes to personalize your fitness tracker will help it keep the most accurate accounting possible. Stride length and calories burned vary greatly between individuals, so it's important to set your device to recognize your details before you use it. Here are five things you can do to make your fitness tracker more accurate. 1. Don't lie about your age, gender, height and weight. At a bare minimum, enter your actual age, gender, height and weight to give your fitness tracker the most accurate starting place for estimating stride length and the number of calories burned. You can refine these by calibrating the device, but these details make a good starting place. If you lose or gain a lot of weight, make sure to adjust the values. 2. Wear your fitness tracker in the right place. Many fitness tracker apps let you select how to wear your tracker. The most accurate place to track walking and running is on your hip or wrist. For biking, wear your tracker on your shoe or clipped to your sock. If you switch activities and move the tracker, change the app settings to reflect the new position. If you're pushing a stroller or grocery cart, you may not get an accurate step count if you wear your tracker on your wrist. If you have a tracker that you can wear as a pendant, it won't be as accurate overall. And if your tracker is wrist-based, wear it on your non-dominant wrist to reduce extra steps. Fitness trackers use algorithms that take into account the physical movement that's associated with specific types of physical activity, like running, biking, swimming and weightlifting. By telling your tracker what you're doing, you help your tracker give you an more accurate reading of your calories burned. 4. Calibrate your stride length. Some fitness trackers have a calibration mode or let you manually enter your stride length. Take advantage of this. To find your stride length, go somewhere you can measure an exact distance, at least 20 steps long. Then divide the distance by the total number of steps. 5. Do the fitness calibration workouts. Most fitness trackers estimate calories burned based on distance covered plus your personal profile data. Trackers with a heart rate monitor use your heart rate to make that number more accurate. You can get an even better estimate by factoring in the maximum rate at which you consume oxygen, or VO2 max. Some device and fitness apps have workouts designed to measure your VO2 max and/or they will determine your VO2 max over time by looking at your heart rate data over the course of your workouts. These apps provide the most accurate calorie burn stats. You should also do the heart rate zone calibration test to ensure that your perceived exertion at a given heart rate matches the right zone. As your fitness level changes, recalibrate. 6. Check for firmware updates. While the sensors in your fitness tracker remain unchanging over time, the algorithms that make sense of the data get smarter all the time. Make sure your device is up to date and making use of the latest algorithms.